The Clare Family were Victorian artists who specialized in, and became famous for, their highly finished and precisely detailed fruit and flower paintings. The family consisted of George (1835 - 1900) and his three sons David (born 1870), Oliver (1853 - 1927) and Vincent (1855 - 1930) - all, except David, were artists. George lived and died in Barnet, Hertfordshire - although it is known that he spent a number of years in Birmingham - evidenced by the fact that his address is given as 173, Bristol Street, Birmingham for the paintings he exhibited during the 1860’s. As to George's artistic training, one is not sure, however his delicate stippling technique and choice of subject matter – still-lives painted against a mossy bank - are derived from the oil and watercolorist William Henry Hunt (1790-1864). George’s works are very precise and detailed, displaying an influence from the Pre-Raphaelite artists who, among other things, were deeply concerned with capturing their subjects in microscopic detail. Among his contemporaries were Thomas Worsey (1829-1875), John Sherrin (1819-1896) and William Hull (1820-1880) – all specializing in finely detailed still-life paintings. George exhibited his first works in 1864 - exhibiting at the Royal Academy, the British Institution and at the Royal Society of British Artists. He would continue to exhibit his works at these major halls until 1874. 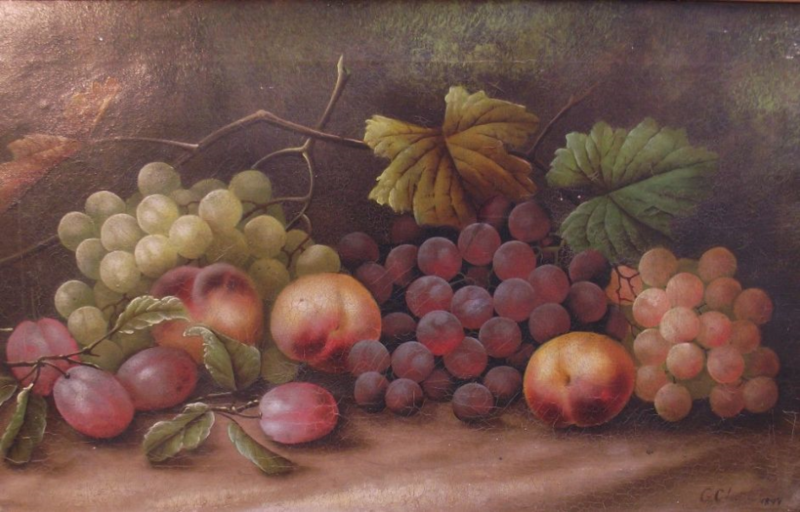 Two of George's sons - Oliver and Vincent - were also artists and became quite famous for their fruit and flower paintings. Oliver was born in 1853 and was to spend most of his artistic life in Birmingham. Though there are no records as to where he received his training, one can be quite certain that most, if not all, of it was from his father - his stippling technique and choice of subject matter are almost identical..